The first of a little series, What's on my nails? I love to see what everyone is wearing this time of year on their nails. So I'm kicking this post off with a striking creamy coral shade from KIKO. It's not as peachy as the photos are showing, it's a rich coral shade which looks bright and cheerful on the fingers. I opted for this shade to help brighten up this terrible weather, it's meant to be spring! Anyway if spring is late in coming then I can enjoy a little colour on my nails in the mean time. Sadly the polish doesn't have a name but if I could name it I would name it- Fruity Coral or Coral Sunset. I love the forumaltion, a pleasure to use, I went for two coats for a nice even finish but to honest depending how thickly you apply your polish you could get away with one coat. This would look amazing with a tan and would look just as fab on the toes! I'm keen to try more of the KIKO cream finished polishes, they cost a very price friendly £3.90. To help my nails grow I've been re-using the ORLY Nailtrition which helps with peeling spilitting nails. With the help of my favourite nail treatment and probably one of the cheapest on the block, Superdrug Cuticle Oil Pen. I don't have a bad word to say about this, I love the packaging, the brush pen is perfect and the lid has a slanted edge to help push back the cuticles gently. The smell of the oil is gorgeous and the price is even better! This is one you all need to add to the top of your wish lists! What colours are you brightening up your hands with? 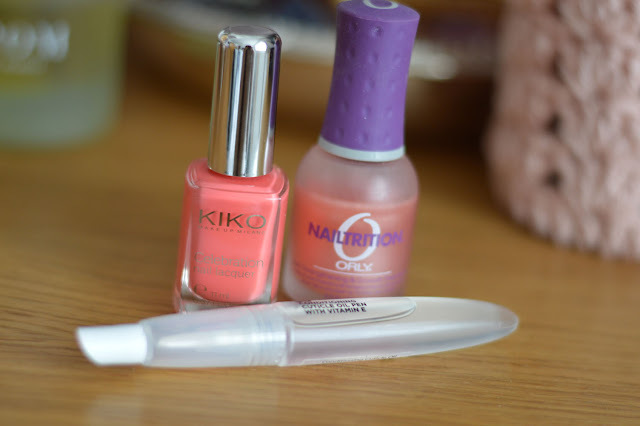 I love Kiko nail polishes, but I was really not impressed with that cuticle pen. I've written a review on it, and read so many good ones... Maybe I got a bad one? !